by Carol Nackenoff and Julie Novkov (eds). Philadelphia: University of Pennsylvania Press, 2014. 320pp. Cloth $59.95. ISBN: 978-0-8122-4571-4. In an enjoyable, well-researched, and well-edited compilation of eclectic case studies edited by Carol Nackenoff and Julie Novkov, scholars examine how non-state actors of various civic, social, and ideological groups during the Progressive Era brought the state back in as a means of achieving desired policy ends. The accounts are notable for drawing attention to previously unexamined policy areas that provide leverage for claims that statebuilding is not always rational or linear, the distinction between public and private actors is not so cut-and-dried, and that the agency of actors is bounded by institutions and prevailing ideologies of the public good. Taken together, the chapters of this important contribution to the subfield of American Political Development exemplify the quintessential nature of the fragmented, piecemeal, inconsistent, and often jarring development of the capacity of the American state. Contemporary scholarship in American Political Development has taken to heart the call to “bring the state back in” (Evans, Rueschemeyer, and Skocpol, 1985) to analyses concerning the development of administrative capacity of the American apparatus. Law figures prominently in this burgeoning line of inquiry; recent accounts explore the relationship between the regulatory power of private lawsuits and the expansion of the American Bureaucracy across several agencies, positing the conditions that empower or constrain agencies as they seek to augment enforcement powers (Mulroy, 2012). Yet, the focus on the agency of bureaucratic entrepreneurs (Carpenter, 2001) and the attention to the role of “courts and parties” as antecedents of the American administrative apparatus (Skowronek, 1982) has come at a price. The upshot has been somewhat narrow inquiries that gloss over the contributions of private associations operating within prevailing legal ideological currents to the development of state capacity. Nackenoff and Novkov’s volume is a welcome addition and necessary qualification to extant accounts of the building of the American state. The ontological basis underlying all of these studies is that the development of state capacity is not “driven by a unified set of intentions, either those of private advocates or state actors.” Relatedly, the nature of statebuilding requires expanding the definition of political development from a durable shift in governing authority “resulting in a new distribution of authority among persons or organizations within the polity at large or between them and their counterparts outside” (Orren and Skowronek, 2004: 123), so as to untether “governance from direct association with [*322] state institutions and actors, thereby increasing the scope for identifying shifts” (p.21). The agency of policy entrepreneurs alone cannot account for increased state capacity, nor can longstanding institutional arrangements and cultural rhetoric be ignored as critical causes of the fractured development of the American state. The volume is loosely organized by policy content, and is further divided into two broad areas of inquiry: the relationship between state actors and groups of non-state policy demanders, and the power of law to both constrain and enable the transformation of statebuilding capacity. Public law and sociolegal scholars will find much to like in these narratives, though the focus on law varies substantially. For example, legal ideology looms large in Ann Marie Szymanski’s examination of the relationship between Progressive Era police powers jurisprudence and both the national and state development of public wildlife protection. No less intriguing is the interplay between common law conceptions of morality and their effect on the development of the “animal welfare state” during the Progressive Era, as expounded by Susan J. Pearson and Kimberly K. Smith. Moreso than any other contribution to this volume, Pearson and Smith examine the complicated interplay between police powers legislation aimed toward protecting the public good, the entrenched doctrine of property rights, and the emerging individual rights jurisprudence of the Progressive Era. Progressive Era police powers Jurisprudence, as well as the jurisprudence of citizenship formed in the crucible of Reconstruction, is meticulously detailed by Julie Novkov as she compares the failed promise of Reconstruction for freed blacks to the Republican Party’s success in stigmatizing and ultimately outlawing polygamy in the Utah Territory. Broadly, these accounts deftly illustrate how entrenched legal traditions, while not infinitely malleable, are woven throughout the statebuilding process and serve to empower and constrain reformers and elites at discrete points of legal contestation. The authors also correct for the tendency to view the constitution of law during this era as an ungendered enterprise. Time and time again, the authors point to language and dominant gender stereotypes of the era as driving the development of police powers jurisprudence. The understanding of women, freed blacks, children, wildlife, and domestic animal companions as “dependent” beings in need of paternal stewardship is a fascinating narrative ripe for further interrogation. These accounts ‘at the margins’ can inform the ongoing quest to determine how social norms and the vessel of legal doctrine intersect to facilitate (or inhibit) increased state capacity. Law, far from autonomous, is convincingly conceptualized here as a constitutive tool that both empowers and constrains social reform movements (McCann, 1994; Andersen, 2009). The contemporary study of federalism may also be fruitfully informed by chapters that examine development at the state and municipal level – specifically, patterns of cooperation between national and state elites, as well as between non-state actors and elites across both institutions and tiers of governance. Novkov and Katherine Sullivan’s explanation for the building [*323] of and institutionalization of the juvenile court system hinges on the agency of policy entrepreneurs in establishing robust networks of support, not only between municipalities, but also between states and ultimately the national government. The role of intermediary institutions is interrogated as well; the media emerge as a key variable in understanding why otherwise recalcitrant southern states (here, Georgia) would choose to adopt a prohibition policy uncharacteristic for the region. Marek Steedman’s account captures this overlooked variable’s effect on the racialized development of prohibition policy in Georgia in the first decade of the 20th Century, “advanc[ing] our understanding of the timing, character, and regional specificity of the movement for statewide prohibition during this period” (p.67). Some marginal variables are especially innovative: The effort to explain the institutionalization of modern garbage disposal techniques in Pittsburgh and New Orleans offers a compelling narrative constructed around a comparative historical analysis. Sullivan and Patricia Strach’s account examines municipal corruption as a key explanatory variable (and overlooked resource) in efforts to address a dire municipal problem for these cities and others during the Progressive Era of statebuilding. The detective work associated with discerning multiple causes of effects, identifying new variables, and examining the intersection of entrepreneurial innovations, media, jurisprudence, and actions of civic associations in a process riddled with contingencies is an endeavor well-suited to process-tracing (Collier, 2011). As well, the accounts direct attention to “moments of fracture, discontinuity, and instability” in order to understand the exercise of political power at the margins; contingency is the watchword animating many of these accounts (Novkov, 2011). The authors of this volume generally employ a combination of these methods, drawing on a variety of archival materials in tracing development to the dynamic interplay of multiple variables. Put another way, the authors generally seek to explain the outcome of increased state capacity via detailed description of the interaction of many variables; this compilation is more about “how did we get here” than “why.” Careful description and the importance of temporal sequencing are apparent throughout this volume, drawing attention to nuanced interactions among diverse political and social actors. As one example, Sullivan and Strach’s “Statebuilding Through Corruption” draws on extensive archival data to buttress their corruption-centered explanation at each stage of the reform trajectory in both cities: “Garbage became a problem, reduction was a solution, the cities chose reduction, and controversy followed” (p.95). There may be some minor quibbles here, as the authors do suggest later that the cities were perhaps not so similarly situated (“Granted, reduction might not have been ideal for any southern city,” noting geographical and convenience considerations unique to New Orleans), and a conclusion to the saga that suggests both funding and a plague epidemic as catalysts for the institutionalization of reduction (p.115). These observations are not meant to disparage the analysis , but it does underscore the difficulty inherent with [*324] this type of research – the power of corruption as an explanatory variable appears to fade a bit as the saga proceeds. While definitive hypothesis testing is often difficult to achieve in social science, the richness of these largely descriptive but also inferential accounts may raise questions among some scholars about the generalizability of the mechanisms and processes of statebuilding examined here. To be fair, at times the contributors explicitly disavow any effort to temporally generalize from their richly detailed case studies. Steedman is instructive in this regard, stating that correcting the scholarly focus on media as a national institution rather than a state or municipal one is “strictly bounded in time by the precise interplay of press and state institutions in the Progressive Era itself” (p.66). 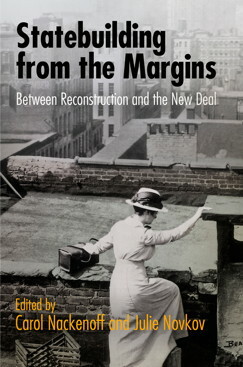 Similarly, James Greer’s account of the autonomy gained in short order by the Federal Housing Administration (attributable in large part to private, women’s civic organizations) seeks to explain a particular outcome for a particular agency central to understanding the origins of the practice of “mortgage redlining” (p.205). Nackenoff and Novkov, as well as the accomplished contributors to this volume, generally seek to provide answers for such questions as “Does the institution remain a hybrid, dependent for certain purposes on volunteers and citizen groups, or does it ever become purely an organ of the state?” (p.26) and, fundamentally, “Is statebuilding always simply muddled and fragmented…What, if anything makes the Progressive Era distinctive when we thing about statebuilding…What, of the things we have learned about Progressive Era statebuilding, pushes us to rethink later developmental trajectories?” (p.3). These varied accounts make clear that a fragmented muddle is an apt metaphor for statebuilding, though it remains unclear what characteristics of Progressive Era statebuilding can travel to other periods of the American experience. The substantive policy areas interrogated by the contributors to this volume suggest new avenues for exploring state-building in other eras of American history. The title makes clear that these examples at the margins of the public and private spheres are the central focus. The goal is not to develop a systemic account of statebuilding, but to illuminate and inform our comprehension of the complexities of the process. Succinctly put, the best answers to the question “What are the causes of increased state capacity?” seem to be the tandem of , “It depends,” and “Causes vary across different policy areas and different periods.” These are valuable insights that cannot be overstated, given the tendency of previous accounts to narrow the lens of inquiry to bureaucratic agents and wholesale, durable shifts across the institutional landscape. Power is often constituted by private associations of policy demanders, who at once augment the capacity and serve as stewards of the state, whether the subjects of regulation are flamingos in the marshes of Florida, the children of Chicago, or household pets. Furthermore, when these regulatory regimes are institutionalized by the capacious state, it is a mistake to assume that the longstanding support and augmentation of private associations simply fades away. This dynamic, wonderfully illustrated in these colorful [*325] accounts, is a necessary corrective to explanations that emphasize linearity, the role of “courts and parties,” and the agency of bureaucratic entrepreneurs as the lifeblood of American political development. This volume will no doubt continue to spur scholars to critically consider how to best incorporate these engaging, thoughtful, and incisive accounts of statebuilding at the margins into a more unified account of the sporadic development of the American state. Andersen, Ellen Ann. 2009. OUT OF THE CLOSETS AND INTO THE COURTS: LEGAL OPPORTUNITY STRUCTURE AND GAY RIGHTS LEGISLATION. Ann Arbor: University of Michigan Press. Carpenter, Daniel. 2001. THE FORGING OF BUREAUCRATIC AUTONOMY: REPUTATIONS, NETWORKS, AND POLICY INNOVATION IN EXECUTIVE AGENCIES, 1862-1928. Princeton University Press. Collier, David. 2011. “Understanding Process Tracing.” Political Science And Politics 44 (4): 823-830. Evans, Peter B., Dietrich Rueschemeyer, and Theda Skocpol. 1985. BRINGING THE STATE BACK IN. New York: Cambridge University Press. McCann, Michael. 1994. RIGHTS AT WORK: PAY EQUITY REFORM AND THE POLITICS OF LEGAL MOBILIZATION. University of Chicago Press. Mulroy, Quinn. 2012. “Pubic Regulation Through Private Litigation: The Regulatory Power of Private Lawsuits and the American Bureaucracy.” Revised Doctoral Dissertation, Columbia University. Novkov, Julie. 2011. “Legal Archaeology.” POLITICAL SCIENCE QUARTERLY 64 (2): 348-361.